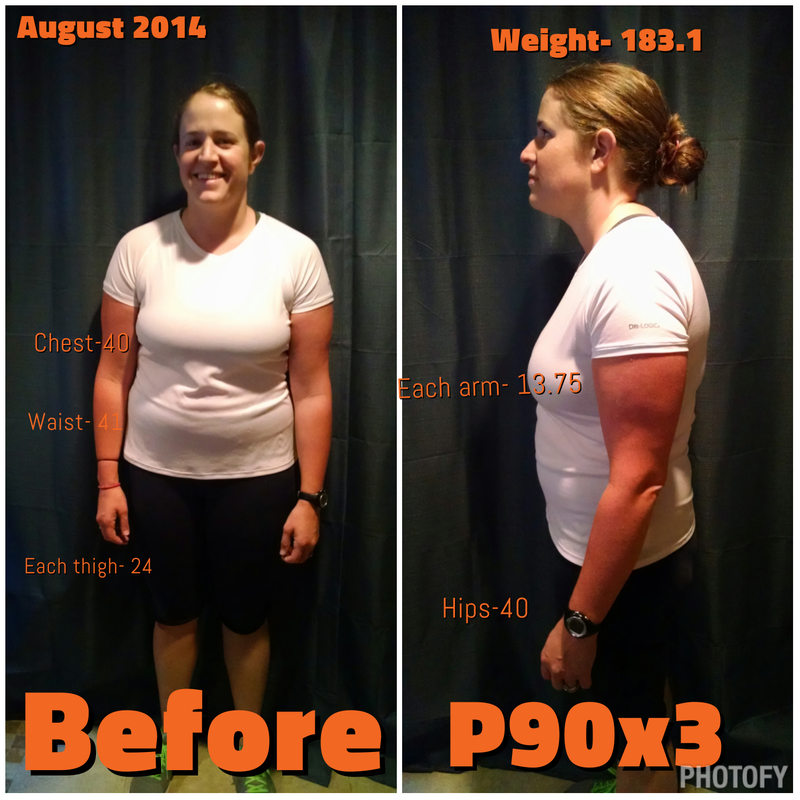 So, I completed P90x3 back in November 2014 but I wasn’t blogging then so I thought I should still share my results for anyone who is looking at that program. 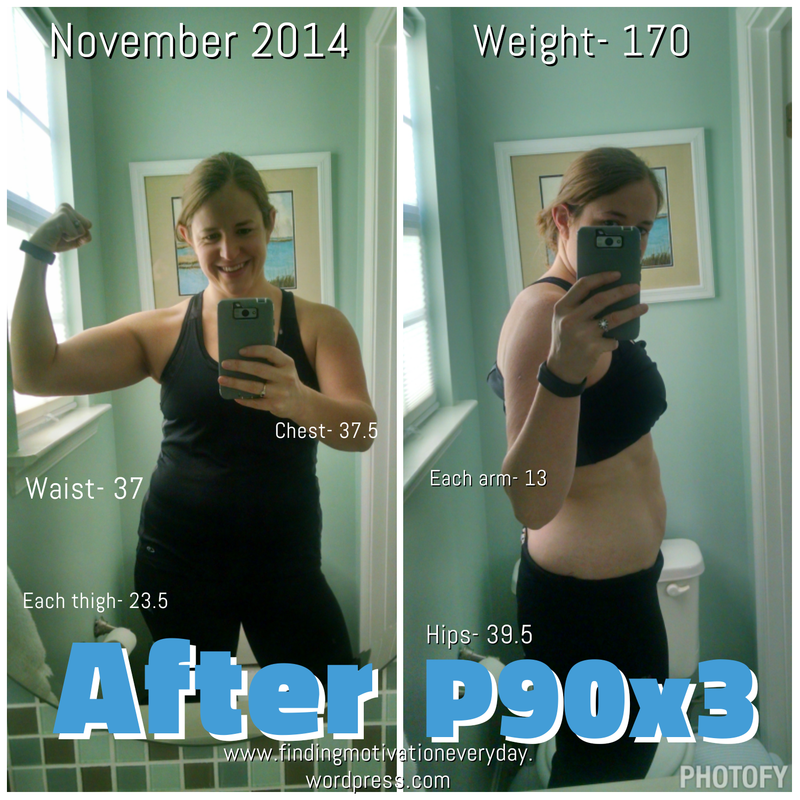 This was my first beachbody program to complete. I was originally looking at T25 because I wanted the cardio but I really like lifting weights and wanted a short program that used weights. I had hit a plautu at the end of summer last year and hadn’t lost weight in 3 months, I needed a change but as a working mom I didn’t have much time. Tony Horton is a genius! 30 minute workouts from my home that offered a lot of variety so I was never bored! I did find I had to mute the TV sometimes because his constant talking got to be annoying but he was motivational and I did get great results! I do NOT like pull ups or push ups so I struggled through those. I lost 13.1 pounds and a little over 11 inches! My diet was not that great so I was thrilled with these results! What is not shown in these pictures is how my mindset changed during these 90 days. I mean, I completed p90x3! That is not an easy feat!!! My confidence went way up not only because I was feeling better but because I was accomplishing something that I never thought I could do! Below I’ll share my pictures and measurements. Honestly, the program was wonderful! This program is perfect for someone who wants to strengthen and tone. If you’re serious about busting through a plateau (hello same weight for like 3 months last year!) and/or are super busy, this program is perfect! Pair it with the right nutrition and it will add muscles and lean you out! Tony Horton does a good job of breaking down the moves but you need some knowledge of working out. I would say this is geared more towards intermediate to advanced fitness people. It’s only 30 minutes a day (so everyone has time!) and the workouts offer lots of variety which I’ll briefly explain below (this information is from the beachbody on demand website- which if you’re a club member the entire program is available!!). Interested in learning more, just ask!! Cold Start: This is an optional 12 minute warm up if you have some extra time. Tony Horton does do a short work out before every workout but the cold start is good if you need a little extra time to workout and get ready mentally. Total Synergistics- Full body resistance workout using dumbbells and chin up bar. Agility X- Working aerobic & anaerobic energy working on flexibility, balance and strength. X3 Yoga-A fast paced yoga working on flexibility and balance. Pilates- A decent home workout Pilates that challenges your core and increased flexibility and stabilize joints. The challenge- Upper body using chin up bar or resistance bands- LOTS of push ups and pull ups!! MMX- This is my FAVORITE! It’s a martial art based cardio workout with punching and kicking. Dynamix- Increase range of motion, flexibility, and stabilization to help your body get ready to move athletically. Decelerator- A lot of jumping around working on going strong and then DECELERATING.